I have read a lot of A.A. Milne’s work this year. I have read his autobiography, original plays and adaptations, a children’s book, articles from his days at Punch, even wartime poetry…I have not so much sampled his work as attacked it, attempting to conquer as much as I could as quickly as possible. It has been a delightful assault but none of it quite prepared me for Peace with Honour. It is shockingly different from the rest of his work and I think that it is his best book – certainly his most important. It is because I want everybody to think (as I do) that war is poison, and not (as so many think) an over-strong, extremely unpleasant medicine, that I am writing this book. We know […] that, of the casualties of the last war, not all were killed on the battlefield; that hundreds and thousands died painfully of wounds – in bed; that hundreds of thousands died slowly of gas-poisoning or disease – in bed. Yet the sentimentalist, knowing this, still visualises death in war as something which comes cleanly and swiftly and mercifully, leaving its victim no more time for awareness than is necessary for a last message to his mother. A man is indeed a hero if, longing for life, he accepts death of his own will. How many heroes do we commemorate each year? How many of the ‘immortal dead’ have deliberately died for their country? Neither in its origins nor in its conduct is war heroic. Splendidly heroic deeds are done in war, but not by those responsible for its conduct, and not exclusively and inevitably by the dead. Of the ten million men who were killed in the last war, more than nine million had to fight whether they wanted to or not, and of these nine million some eight million did nothing heroic whatever before they were killed. They are no more ‘immortal’ than a linen-draper who is run over by a lorry; their deaths were no more ‘pleasant’ and ‘fitting’ than the death of a stockbroker in his bath. Milne is adamant throughout the book that there is no such thing as a just cause for war. Ever. Oh, the irony. At the end of the book, Milne accuses the world’s leaders and opinion makers of lacking the imagination to envision a world where all the nations of the earth could agree to universal peace. But Milne also lacked imagination: he could not conceive of circumstances under which he would condone war and yet by the end of the 1930s, his hatred of Hitler was so intense that he was a full supporter of war. What changed? When Milne wrote Peace with Honour, he was thinking of and fighting against the idea of war as a way to resolve an argument between two or more nations, usually over territory or resources or – worse – a matter of pride. These were wars where there was economic value at stake or emotional value but never anything of real worth – nothing that one could objectively judge as right or wrong. One nation wanted something another had and so they tried to take it. One nation wanted to appear stronger or become larger so they attacked another. An oppressed group wanted freedom so they fought their oppressor. Those were the only kinds of war the world knew and that was what Milne reacted against. These were not causes worth dying for and, more importantly, they were causes that could easily (if perhaps more slowly) be settled by diplomatic rather than violent means. If Hitler had just been another Napoleon, intent on creating an empire, I think Milne would have remained a pacifist. But Hitler wasn’t another Napoleon. For Milne, it became a battle of Good versus Evil. …however completely Fascist leaders may seem to have forgotten the horrors of the last war, we may be sure that the supreme horror of war is vividly in their minds: the knowledge that those who lead their country to Armageddon have no chance of surviving defeat and but little hope of enjoying victory. Nothing is more certain in the uncertain future of Europe than that, if Fascist Germany or Fascist Italy is involved in the next war, it will not a Fascist Germany or a Fascist Italy which will come out of it. Even if (which is unlikely) civilisation survives that war; even if Germany is still a nation and Italy is still a nation; it is absolutely certain that there will be no Hitler, neither will there be any Mussolini, who will direct their destinies. Knowing the violence with which Milne opposed Hitler, it was fascinating to read this and attempt to reconcile Milne’s passionate pacifism with his later Churchill-esque zeal for war. It is surprising how easy that is to do. He lays out his arguments so clearly, illustrates them with such approachable examples and analogies, that you are never in doubt as to what he believes and what he thinks is right and it is easy then to see how he could have viewed the war against Nazism as just. There were so many other passages I wish I could have quoted but that is the kind of book this is. Milne’s arguments are extraordinarily well done, so passionate, so heart-felt and so well-written. It is an idealistic and overly hopeful book, especially in light of what was going on elsewhere in Europe at the time, but it is persuasive. If I could only pick one of Milne’s books to share with other readers, this would be it. What a wonderful review, Claire! When I sped through most of Milne’s work ten years ago, this was my favourite of his books (tied, perhaps, with his autobiography) but it’s been so long since I read it that I latterly decided that I couldn’t have thought it quite as good as I remembered thinking it. But it seems that my early appreciation for it was probably just – and I must re-read it. I do remember it being brilliantly – and often wittily – argued. Thank you for such a brilliant post, Claire. I can never say enough how much I love your posts on AAM this year. I think Milne’s autobiography remains my favourite of his books that I’ve read this year but Peace with Honour comes a very close second. When it comes down to fond and amusing reminiscences versus a book about war – no matter how wonderfully expressed – my preference is always going to be for the happier subject matter. Still, this book is as good as you remembered it and it would be very interesting to reread along with the other books you mention. I read Behind the Lines around the same time as this, which was another interesting pairing. It doesn’t lay out Milne’s reasons for supporting the Second World War as clearly as I believe War with Honour does (I haven’t read that one yet) but nevertheless you get the idea (especially when he is going on about good v. evil). I am glad you are enjoying my Milne posts and I am certainly enjoying having another Milne fan to talk to about the books! Yesterday I saw an exhibit of war photography, from the 1840s to the present, and reading this sounds very appealing in light of that. It would also be interesting to compare Milne with Vera Brittain. Thanks, Claire. That sounds like a fascinating exhibition, Lisa. An impressive and impassioned post. Really impressed and I must read more Milne. With every one of these Milne posts you renew my interest in digging up more of his work. I think I need an English vacation to go book hunting…wonder if that would fit into my stocking this year? 😉 Thanks for another great review! I am not sure how easy all of his books are to find on either side of the Atlantic – I know some of the plays are particularly difficult to track down – but I will always encourage a bit of bookish tourism! Wonderful insights into A.A. Milne. I really enjoyed reading this, today on the anniversary of his birthday. I have only ever read his children’s books and I know he was frustrated to not have had more success with his other writings. You have inspired me to pick some of them up. 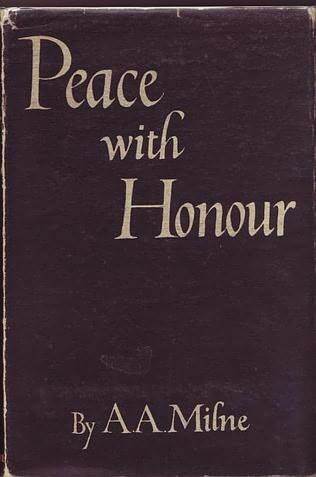 I have a first edition of Peace with Honour that I purchased back in the early 90s, there is a newspaper clipping from The Observer dated 1934 with a write-up of this book also that was tucked away in this book. Also someone, I presume English, has written in the margins, arguing with Milne. Very interesting. Thank you very much for this. I am also a pacifist. Protested the war in Vietnam from age 15-20 in Washington DC (3-4 times a month I marched with Amish people & other non-violent types). I really enjoyed reading this. It is strangely difficult to track down right now. I suspect the best option is to use your library and their inter-library loan system if they don’t have a copy. Came to this after watching the movie, Goodbye Christopher Robin, because I was curious about this work and because I also hate war. We are only now starting to recognize the need for peace. We are able to do this due to the courage of people like A A Milne. Thank you for the great review of a brilliant book.